From my first lunch here I knew this was special. Many subsequent meals have proven me correct. Personal favorites are Dry Chile Fish Fillet, Tai Gan, Twice Fried Duck, Ground Pork w/Sour Pickle, Famous Stir Fry Lamb, Chiles in Black Bean, Jade Tofu- the list goes on. I will emphatically second this one. This is the one restaurant in Chinatown that I crave on a regular basis. I have not experienced any of the inconsistencies or poorly prepared dishes that some have and, yet, I doubt I'd be overly concerned if I did have a miss or two amongst the now dozens of dishes that I've sampled in the last 6 months. This nomination reminds me that it's been at least a month since my last visit and I need to get there stat! Of all the new places that have come into the LTH consciousness in the last year or so, Lao Hunan is the one I visit most often and enjoy the most. A hearty second of this nomination from me. boudreaulicious wrote: Lao Hunan is, quite possibly, my favorite restaurant in Chicago right now. I have had wonderful group meals, the most recent being an ALL VEG dinner for 10--so many wonderful options, no one missed the meat and seafood and considering how terrific their meat/seafood options are, that's saying something. Stewed Tofu Xiangxi style, Famous Hunan Chili in Black Bean Sauce, Napa Cabbage in Mashed Dual Chili Sauce, Eggplant Casserole Sichuan style, and that addictive amuse of raw cabbage with chili. Hmmm, I may have to do this for dinner tonight! I really like this place and endorse the nomination. That said, there are more than a couple posts on the main thread which seem to indicate that food quality is varying widely and has, perhaps, dropped off a bit since when it first opened. I don't think that should take the place out of contention for a GNR but it is tempering my enthusiasm a wee bit. ronnie_suburban wrote: I really like this place and endorse the nomination. No problems with dinner for 17 last month. I have not experienced any differences in quality or service, except they now know I want continuous refills of my raw cabbage amuse. We went after a Bulls game on Presidents' Day (2/20) and I didn't see any drop-off in quality. In fact, I would say service has actually improved significantly. It sound like some personal reconnaissance is in order. I'll use anything as an excuse to go to Lao Hunan. LOL! I didn't mean to point solely to the experiences of others. For me, the only significant drop-off has been with the famous Hunan chilis dish. It's never been as good as it was the first time I had it and seems to be getting worse each time. Other than that, I've had no real issues. I've posted a lunch for Monday 3/19 on the events board. Let's have a nice meal there during the discussion period. I heartily vote YES. I went there for the vegetarian mass ordering event organized by pairs4life and almost very dish was fantastic. And I did not even get to try the 100 yr old egg dish and the "strange Flavor Tofu"! But the two dishes that stood out were the Jade Tofu, Hunan style Chili in Black Bean paste. But almost all the other dishes were really really good. I'm having a bit of a conundrum. Many dishes of the restaurant I love enough to nominate for a GNR have changed since I've last been (Xmas). The last few months have been busy for me and I've not been on my food game as I once was. That said, my nomination was based on the food I'd eaten there many times prior. For my taste and memories, the changes are not for the better. Several of my favorite dishes were barely representative of their past glories. The cabbage amuse, sour pickle w/pork and most painfully, the tai gan are but shadows of their former selves. I was pouting on first bite. The tai gan was so unrecognizable that I looked to make sure they had the same chef (they do) and went to speak to the waitress about it, who after a few queries on my part, admitted that they're sourcing them locally instead of the original batch that was from China. Today was texture only. Gone was the remarkably complex flavor packed umamibomb. A pity. If today is the new norm, not one of these dishes would I reorder. Speaking of ghosts, the chile peppers w/black beans, the ones that had Steve Z and I levitating above our table the first time we tried them (while still delicious, particularly over rice) pack a fraction of the capsicum buzz that made my ears turn red and blood feel electric. Today they're all fillets of jalapeño like peppers, when they were whole and varied before. The heat (and thrill) is gone. Yet lunch was still very good. Dried chile fish fillets and famous lamb were good as ever and a couple new dishes (for me) were excellent, my favorite being the tofu w/mushrooms, a dish I probably wouldn't have ordered on my own and enjoyed immensely. Thanks Jen and MBH. So what to do? Lots of great food still to be had there, but can't help but feel like a victim of a bait and switch scam. I know, I nominated them and they still may be deserved of a GNR- that's still up for discussion. But I can't let it not be mentioned that it's not the restaurant I thought it was. Perhaps an off day or is it the classic Tony tease? While capable of bringing us to new heights, he's also capable of shattering disappointment. Not the first time he's let me down but his track record on the whole keeps me coming back. Food for thought. Discuss again. Last edited by Jazzfood on March 20th, 2012, 7:21 am, edited 1 time in total. Take comfort (if you like): I thought today's were better than the previous batch I had. Not spicy, but more thoroughly stewed, and richly smoky. Whatever heat may be missing (due to adjustment for audience, or seasonal sourcing issues, they haven't been open for a full round yet), I still find deft and original flavor, and it is a deep (and still largely uncharted) menu. I might have nominated Lao Beijing first largely because of stellar special-event delivery (eat-in and takeout) and longer delivery, but am happy to support Lao Hunan. Jazzfood wrote: I'm having a bit of a conundrum. Many dishes of the restaurant I love enough to nominate for a GNR have changed since I've last been (Xmas). The last few months have been busy for me and I've not been on my food game as I once was. That said, my nomination was based on the food I'd eaten there many times prior. For my taste and memories, the changes are not for the better. Several of my favorite dishes were barely representative of their past glories. The cabbage amuse, sour pickle w/pork and most painfully, the tai gan are but shadows of their former selves. I was pouting on first bite. The tai gan was so unrecognizable that I looked to make sure they had the same chef (they do) and went to speak to the waitress about it, who after a few queries on my part, admitted that they're sourcing them locally instead of the original batch that was from China. Today was texture only. Gone was the remarkably complex flavor packed unamibomb. A pity. If today is the new norm, not one of these dishes would I reorder. I was part of the group who met for lunch today, and I had been putting off posting until I revisited the restaurant. Overall I found the meal to be very disappointing. The hunan chiles were not simply less spicy, they were borderline not spicy at all! My go-to dish of ground pork and sour beans also let me down today. The spice level is not my only reason for disappointment. I found many of the dishes to not only lack the spice factor, but a lot of my favorite dishes didn't seem to have the same flavor punch as previously. I don't think the lack of spice is at fault, I also think lack of Szechuan peppercorns and other spices may be at play too. It's too complex a cuisine for me to explain the difference, but the quality of many dishes doesn't seem to be the same anymore. In it's prime I had eaten at least few great meals there, and was amongst the rest of the group singing my praises, and exploring the menu with glee. I was also the first to post about a worrisome meal I had there. I really didn't want to believe it, but after a couple other meals which seemed to be on a steady decline, then again today, I'm fairly certain there is a pattern. Lao Hunan is relatively new, and it seems working on the right customer satisfaction vs. profit vs. spicy ratio. Perhaps they will realize their mistakes, or perhaps they're making the correct decision for their bottom line. Whatever the case, I think they need time to work these kinks out. I am very sad to say it, but they have gone through too drastic a change for me to fully support the handing over of a GNR. I was at the luncheon on Monday and I needed to think about this for a couple of days. I agree the meal we enjoyed had some off dishes. The Tai Gan and the Chilies in Black Bean sauce certainly didn't have their former level of spice, but the complexity of flavor in most of the dishes still blows the doors off most other restaurants. I went to the all vegetarian dinner with pairs4life and was really impressed with the variety and depth of the dishes we had. The Stewed Tofu Xiangxi style, the Japanese style Tofu with Mushrooms and a crispy noodle dish that I can't remember were all standouts for me. I also usually go in the evening not at lunch and there is one particular waitress who told me her name was Venus (yes, really) who has guided me through the menu when I've needed it. I tell her what I'd like and what level of spice to make because sometimes I'm with heat adverse friends and she's never steered me wrong. I still think Lao Hunan is head and shoulders above other restaurants, they haven't fallen off so badly in my opinion the they don't deserve a GNR. I say yes. I was at Monday's lunch and I have to say that I don't happen to care if a dish is more or less spiced. My first trip to Lao Hunan was last November and I didn't think it was "blow my head off spicy" then the way some were saying. I can't really remember if the chili with black beans was fiery hot back then, or which of the 5-8 times I've had it were more or less spicy--that's not what I remember about the dish because for me, it's not the most important component. I also don't really mind when flavors are different in a dish, so long as they're great. I loved the pork with sour/pickled/whatever beans as much as ever, even if it didn't blow my head off, because the pickled veg with the pork is such a fantastic combo. To me, the lunch on Monday was as good as ever--which was pretty great. I believe Lao Hunan is a GNR because I start thinking about when I can return almost as soon as I walk out the door every time I eat there. To me, more important than the spice levels being considerably off, are the flavor profiles being different and not to my taste. Particularly w/the cabbage, tai gan and sour pickle. I agree, you can still have a wonderful meal here, just not w/many of the items I grew to love in the short period of time before they "changed". It was a tease. Have to say I'm on the fence w/it @ this point. I'm truely disappointed although not surprised. I've been to Lao Hunan only twice, but the difference between the two trips couldn't be starker. On my first trip everything was assertively spiced. This is a key element of the food since many of the dishes are stewed in oil or fried. The spice is an important part of these dishes since it counterbalances the richness. I'm not just talking about chili heat either. Many of the dishes were garlicky or sour and even a couple were szechuan peppercorn numbing, all in a very pleasant and interesting way. My first experience with Lao Hunan was eye-opening and I've been excited to return ever since. Easily one of the best meals I've had in recent memory. I made it out earlier this week with a group of LTHers and most of the dishes were the same as I ordered the first time I went. However, the spice level was decreased significantly. The food was still tasty, but the enthusiasm I remember having after my first meal was missing. This second meal was good for Chinatown, but not good enough to make we want to rush back. Let's face it, there are a lot of good options around there. Many of the dishes were uninteresting or lacking punch. There was no question in my mind that we were being served toned down versions of what I'd enjoyed 3 months earlier. Even though the dishes still tasted good, the memory of my first trip made my second trip disappointing. It's not uncommon to be served toned down food at ethnic restaurants. Frequently I stress to the server that I want my food authentically spiced or funkified. Often I'm successful, but not always. My inclination is that it wouldn't be too hard to get Lao Hunan to deliver the goods with a little coaxing, but unfortunately it hasn't been open long enough for me to know for sure. This inconsistency makes me think it's too early to crown them a great restaurant. To me, right now it's a good restaurant with the potential for greatness. Could there have been a change in cooks? Elfin wrote: Could there have been a change in cooks? There was no change in cooks. The same guy was cooking on Monday that was cooking on my very first visit just days after opening. The quality of some of the ingredients along with the spice levels had both gone down, though. I'm still not sure where I stand on Lao Hunan's GNR worthiness. I'd like to think about it some more and hear from others that might have dined there recently. Jazzfood wrote: The tai gan was so unrecognizable that I looked to make sure they had the same chef (they do) and went to speak to the waitress about it, who after a few queries on my part, admitted that they're sourcing them locally instead of the original batch that was from China. Though I posted above that the only inconsistency issue I'd experienced at Lao Hunan was with the famous Hunan chiles in black bean sauce, the discussion here is reminding me that on my last 2 visits, the Sour Bean with Ground Pork had also morphed into something noticeably different (and less tasty) than on my initial visits. Yes, it was less spicy but it also seemed that the entire flavor profile of the dish had changed. I ate there twice last week. Took a writer who thought the pork and sour pickle was the best Chinese she'd ever had. It has yet to disappoint me on the vegetable offerings or any meat eater I've ever taken with me. Let's be careful about issuing a Downhill Alert for Lao Hunan just yet. Based on some of the posts above, it does appears they may be suffering from some consistency issues, but I didn't really notice any such issues* when I shared an excellent meal here on Friday night. I strongly suggest that Jazzfood and some of the other posters above give Lao Hunan another shot. Dry Chili Fish Filet - Hot, crispy, flavorful, and delicious. The question of how tilapia can be made to taste this good seems to come up every time I have this dish with a new group. Famous Prawn in Hot Wok - This was the surprise of the night for me. These shrimp were cooked and spiced similarly to the dry chili fish filet, but served in a hot pot in a sauce with sliced onions and peppers. Excellent. Climbing Ants - A new dish for me, and a hard one to describe. I'd call it a noodle stew with ground pork and preserved black beans, in what you could call either a thin brown sauce or a thick brown broth. In any case, I liked this dish very much and would definitely order it again. Famous Hunan Chili in Black Bean Sauce - As good as ever, and although perhaps not as spicy as I've had them before, they were still pretty damn spicy. If they used to be a 9 in heat, they were a 7 on Friday. I didn't break a sweat eating them, but still loved these peppers and wouldn't consider eating at Lao Hunan without ordering them. *I agree that something has changed with Ground Pork with Preserved Sour Bean. The intense capsaicin thrill of this dish is gone, the beans aren't nearly as sour as they used to be, and it is greasier than I remember it. Still good, but not the standout dish that it used to be. Oh well. When Ronna and I first moved to Chicago, we were thrilled to find the GNR list (and LTH) because it helped us to learn of restaurants like this one. 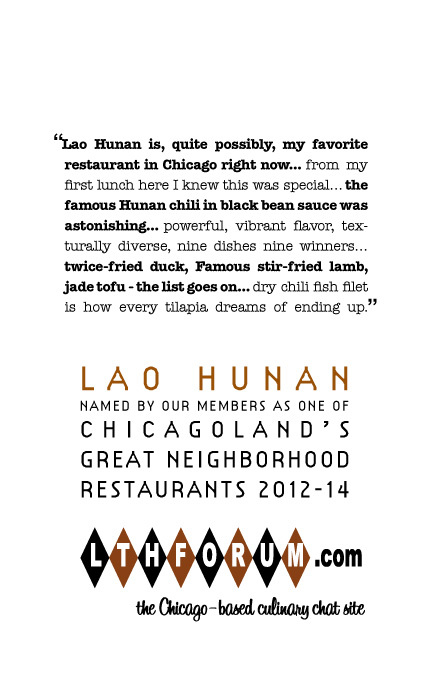 For me, Lao Hunan is exactly what the GNR program is about and should be an easy, slam dunk to receive a GNR award. My wife and I joined RAB and REB for this meal and it was easily one of the most memorable meals I've had in a long time (and not only because of Rich and Ronna's excellent company). The Hunan Chili in Black Bean Sauce and the Dry Chili Fish Filet, seemingly simple dishes, had flavors that just popped. Chairman Mao's Favorite Pork Belly - cubes of braised pork belly with red and green peppers in a nice, mildly spiced and slightly sweet sauce. The dish had nice, clean flavors and I liked it a lot. This was an amazing meal and though it was my first time there, I very much hope it is recognized with a GNR.